Infrared heat is healthier, more comfortable, and a more efficient method than any other source of domestic heating. Infrared heat provides many of the benefits of natural sunlight without the dangerous effects of UV radiation. 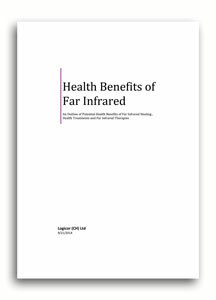 Take a look at our summary report outlining some of the reported health benefits of Far Infrared heating and therapies from around the world. ​Although there is a large body of evidence and medical acceptance that Far Infrared heating is actually good for you, the fact is that we don't claim these health benefits ourselves because we haven't tested them. What we claim is: "Our Clear Heater System can heat your home or office in an highly economical way without directly heating the air". Using less energy saves you money, which has its own natural feel-good factor. An economical heating system means that more people can afford to heat their home to a more comfortable and healthier temperature: a social as well as health benefit. Clear Heaters warm people and other objects in a room rather than directly heating the air (radiant heat rather than convection). The same level of body comfort can therefore be achieved with a lower air temperature. Lower internal air temperature means that the air itself and humidity levels are healthier and air circulation inside a room is reduced. This reduces the risk of mould and damp formation as well as the spread of airborne particles, dust and spores. In short, one of the biggest health benefits of a Far Infrared heating system is that your home or office climate feels healthier and is actually healthier to be in. Feedback from our customers support these findings but if you want to read more on the subject there is a wealth of information in books and on the internet about the benefits of infrared heating, or read our summary report on the potential health benefits of Far Infrared.